It’s finally happened, Nvidia FreeSync. Yes, team GeForce is actually supporting AMD’s FreeSync monitor feature on its graphics cards. 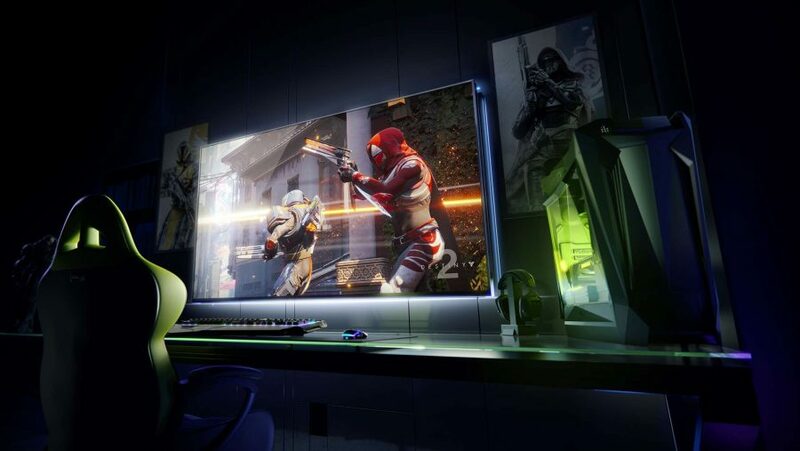 Of course it’s not actually saying that, nooooo, Nvidia is supporting gaming monitors with the Adaptive Sync feature… which just so happens to translate into any display with FreeSync support. So yeah… Nvidia FreeSync, here we go. The G-Sync Compatible initiative was launched with the release of the RTX 2060, and its associated driver update, but it isn’t just limited to the new 20-series GPUs. Any 10-series Nvidia graphics card and above is capable of supporting G-Sync as standard and will now be able to enable the setting with their FreeSync-ready panels. But, unless you have a display that features on Nvidia’s very short shortlist of G-Sync Compatible gaming monitors, then it won’t be enabled automatically; you’re going to have to do some control panel digging yourself. It’s quick to set up, and therefore easy to see if your FreeSync monitor will happily synchronise with your Nvidia graphics card. The company has stated that of the 400 monitors that it has validated only 12 have passed with flying colours, but that shouldn’t stop you from trying your panel out to see how it fares. 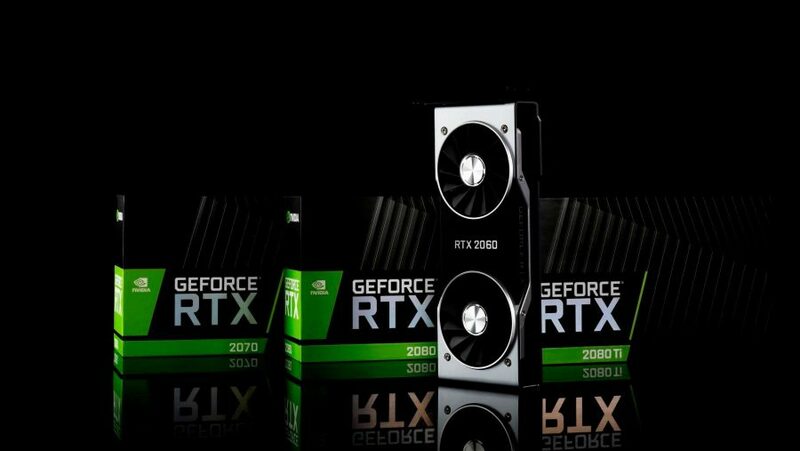 When Nvidia first announced the feature at CES this year it said that “it may work, it may work partly, or it may not work at all.” That might not fill you with confidence, and there have been reports of some FreeSync screens flickering, or becoming increasingly blurry, with the G-Sync Compatible setting enabled. But we’ve tried it out in the office on a non-validated Asus FreeSync monitor and it looks fantastic. The first thing you need to do is make sure you’re connecting via DisplayPort as, at the moment, HDMI support is not enabled for the feature. You also need to be running a recent version of the Windows 10 OS. It might also be worth running Display Driver Uninstaller first to ensure a completely clean install of the new Nvidia driver. Once you’re connected properly, and you have the latest driver installed, you may need to enable FreeSync within your monitor’s own settings. It will likely be inside the image section of the on-screen display. Select the FreeSync monitor (it will likely be the one with the Nvidia logo on it) and adjust the refresh to the highest available. On our Asus ROG Strix XG32VQ monitor it dials back its maximum refresh rate from 144Hz to 120Hz with this driver in order to offer support, so be prepared for that possibility. Now select the ‘Set up G-Sync’ tab under ‘Display’ in the Nvidia Control Panel and ensure that the ‘Enable G-Sync, G-Sync Compatible’ is checked. 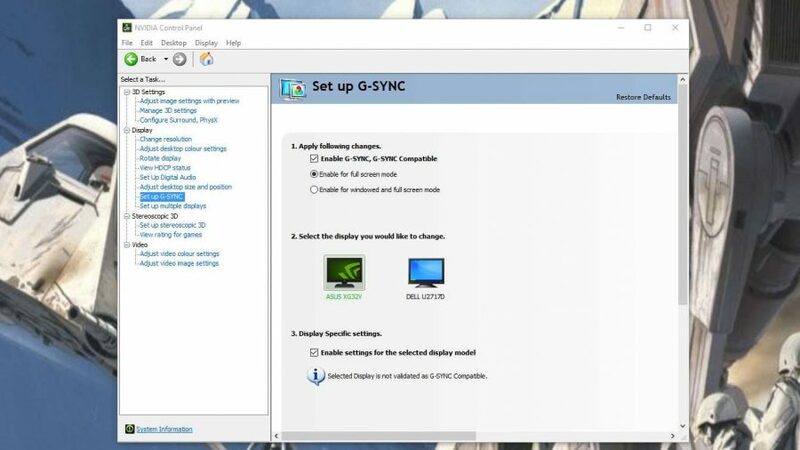 In the bottom right of the Nvidia Control Panel window hit ‘Apply’ and the monitor should quickly reconnect with all its G-Sync Compatible magic and you can test to see just how compatible it is. If you’re lucky that will be the end of it and you’ll be able to play your favourite games without tearing and with all the added smoothness of your monitor’s refresh rate being synchronised with your Nvidia graphics card. And all without needing some extra, expensive G-Sync hardware baked into your monitor. 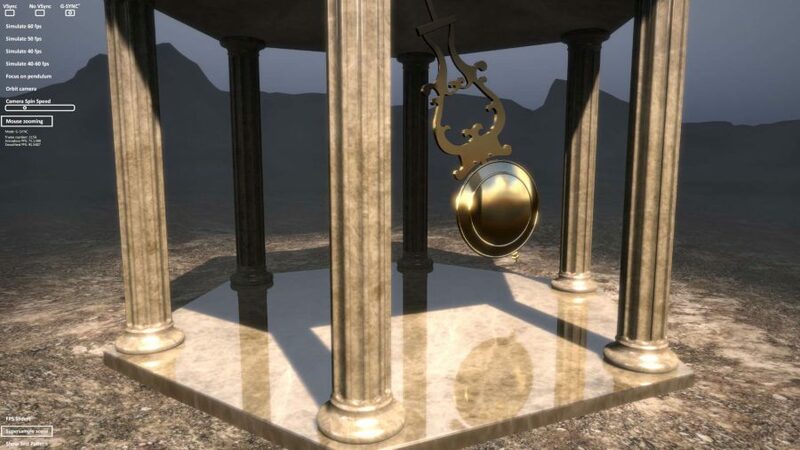 Nvidia created a handy little demo for G-Sync back in 2013, and the Pendulum Demo is still a useful tool for checking to see if your dream G-Sync/FreeSync combo is working out. If you’re unlucky then you might experience some of the blurring and flickering that Nvidia has said is possible with some weaker FreeSync-ready displays. 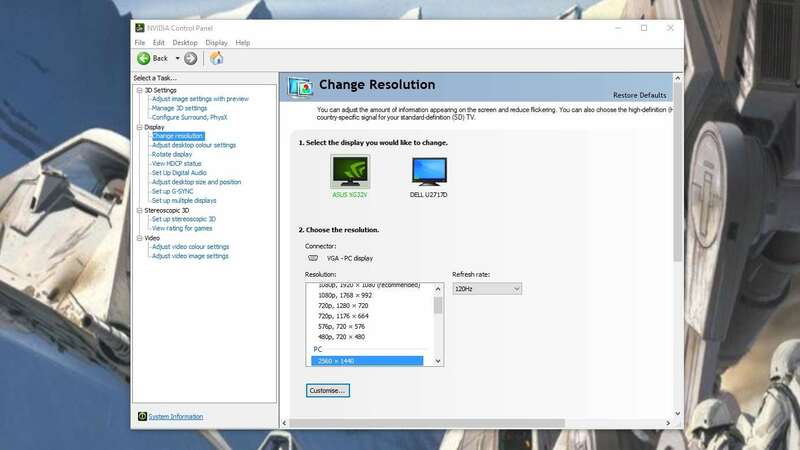 There are reports that you might be able to mitigate your monitor’s FreeSync issues by extending the lower frequency range of your panel using Custom Resolution Utility (CRU). Some displays’ ranges are very narrow and this can limit their effectiveness, though some are simply unable to operate outside of that limit. With the CRU app installed you will need to click the Edit button at the top of the main screen next to the name of your FreeSync monitor and add in a lower frequency. 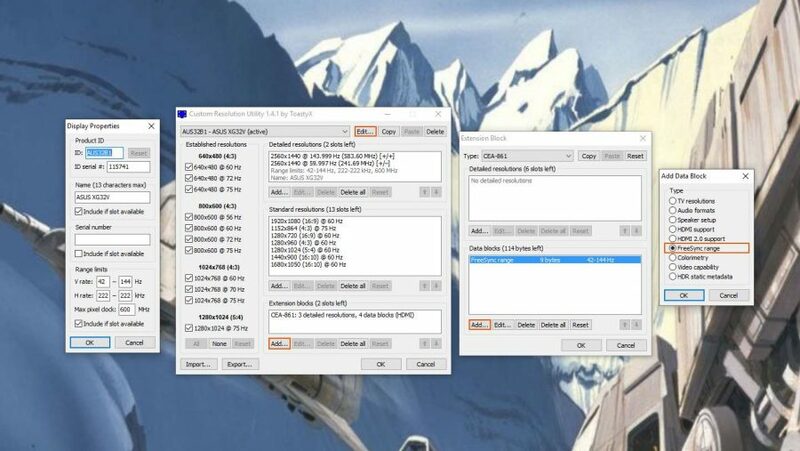 Match this frequency range by adding an Extension Block, and if there is no FreeSync Range data block displayed in the subsequent screen you can add one in and click OK.
Then restart your PC and test the new range using the Pendulum demo. If you end up with a black screen, or notice any artifacts, when the demo starts you will need to up the lower frequency in CRU, restart, and try all over again. Let us know in the comments how you get on with the new G-Sync Compatible feature and whether it’s working for your FreeSync monitor.